We did it! We finally picked our own produce. 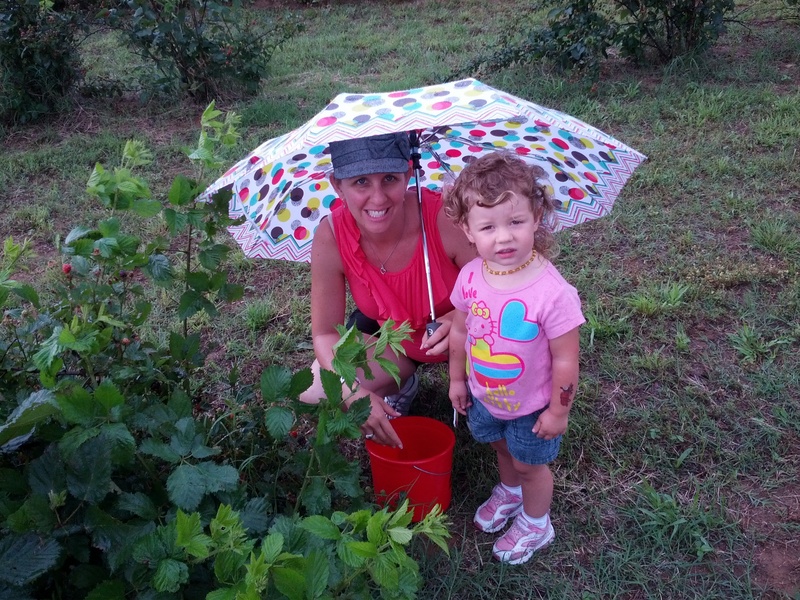 If you caught my photos on Facebook, you know we did some blackberry picking at the R and C Dairy, in Collinsville, TX, last weekend (found from this site). I made the call for our reservation for Saturday morning, but little did I know the rain would get us. As we were driving north, you could see this dark line of clouds up ahead that was slowly moving south. 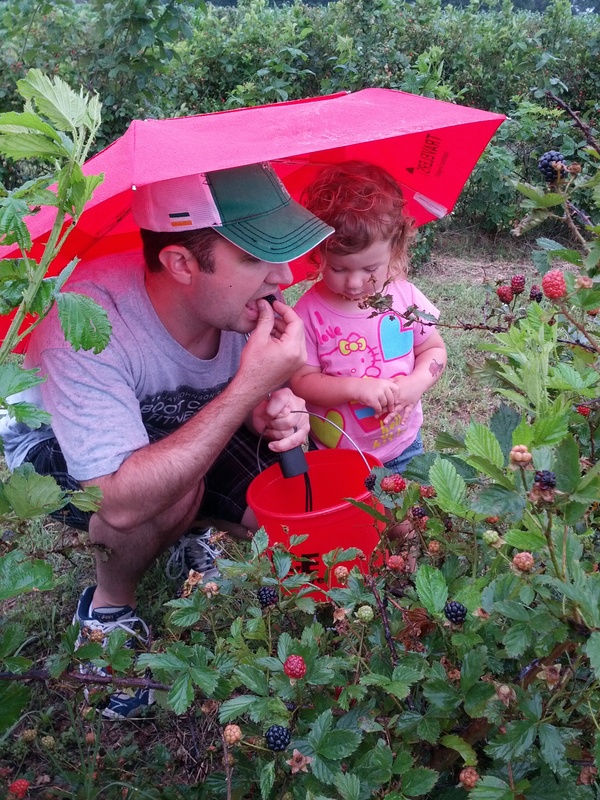 I was super excited…and when you travel 30 miles with a toddler, to pick fresh blackberries, there’s no turning back! Luckily, I packed my umbrella just in case, and Josh happened to have one I packed in his truck some time ago-so we were set. Once we got there, we thought it wasn’t too bad, but alas, you could hear it pounding on the tin roof we were underneath, so we decided to hang out for a bit. I’m glad we did and glad that it finally let up…I was worried there for a bit. 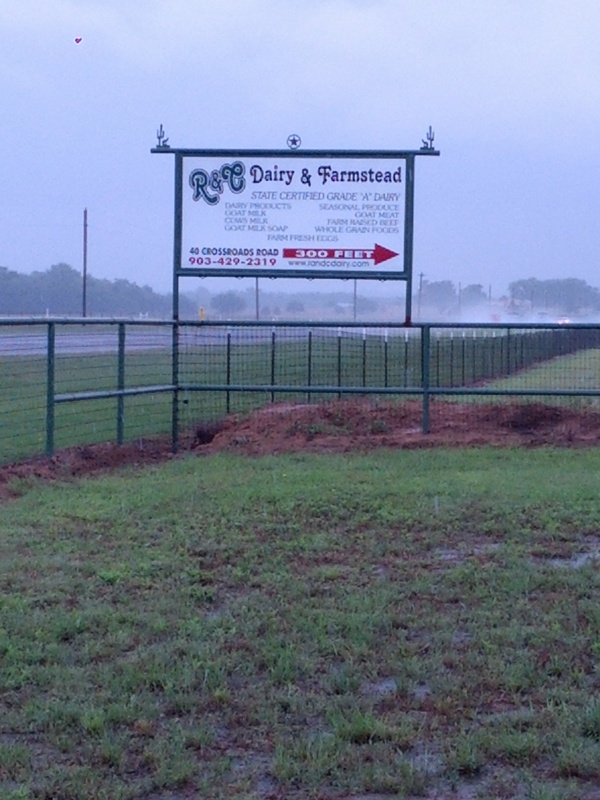 So, we grabbed our umbrellas and headed out into the fields. 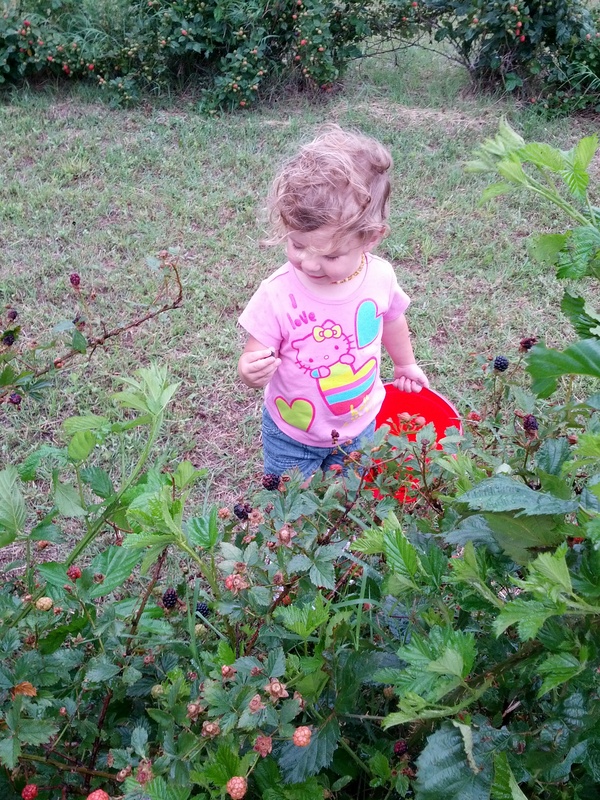 It was my first time to pick blackberries, so you can only imagine how giddy I was to fill our buckets to the brim! I also had an ulterior motive in that I knew I might get the tail end of strawberries, since they had just wrapped up the week before. Josh is learning to never doubt that I’m always scheming planning ahead. Since it was my first time, I also knew nothing about all the thorns we would encounter. My neighbor mentioned it but I thought nothing else about it. 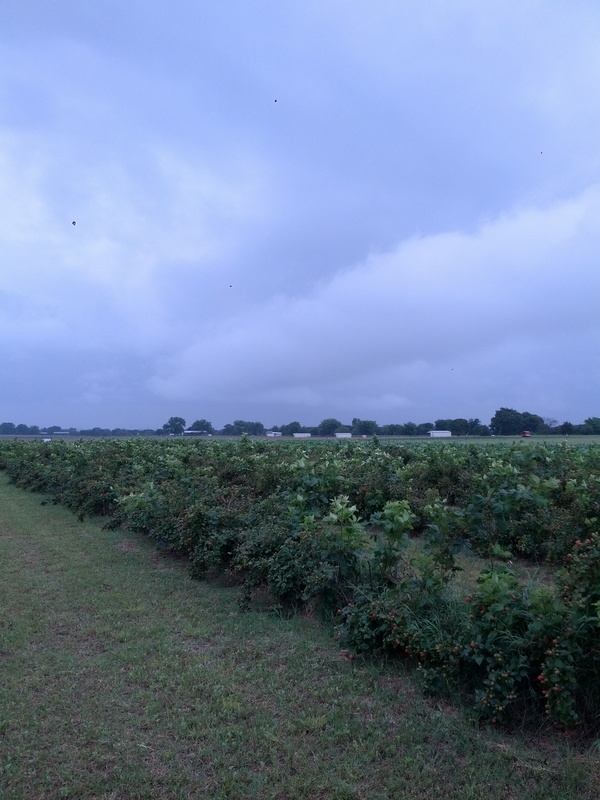 Well wouldn’t you know it, the biggest, juiciest berries are in the middle of the bush–among the plethora of thorns. But I was a determined mama, so I dug deep, scraped up my hands while getting a few splinters, and picked those juicy bad boys. We were slowly making progress when we stumbled upon a ‘honey hole’ as Josh called it. Then Emma announced she had to go potty. I had to go for some time but I didn’t feel like making the trek back to the bathroom then walk back to the field, so I held it. Emma was quite the trooper while we continued to pick and didn’t complain too much. 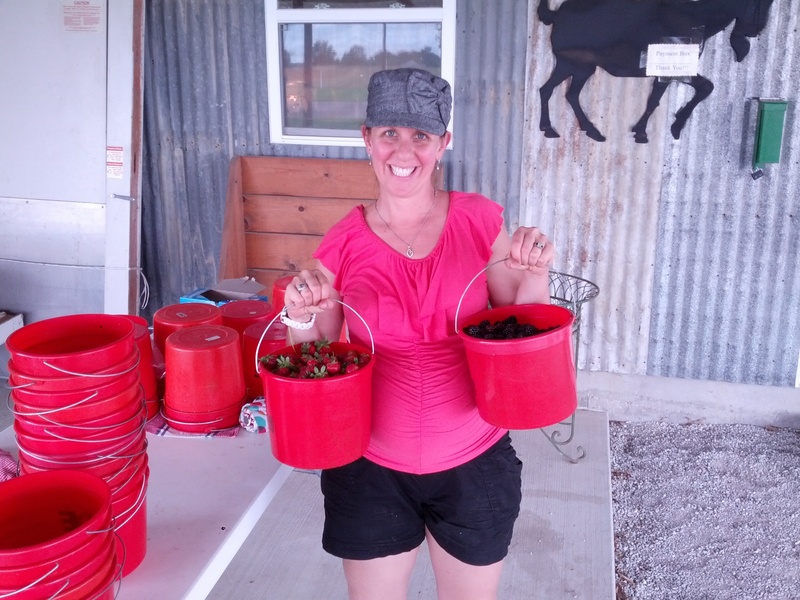 I decided to leave Josh behind to finish his bucket, and when mine was about 3/4 of the way full, I headed to the strawberry rows to see what I could scavenge. 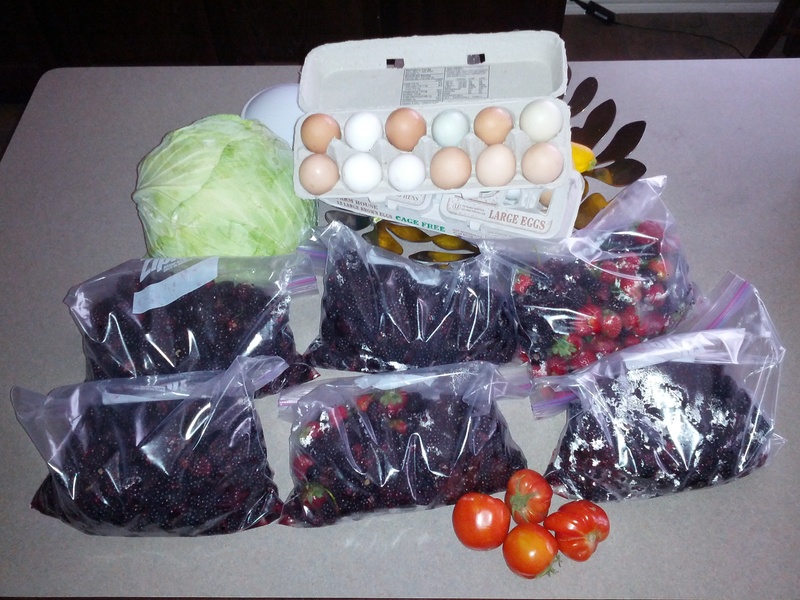 After about an hour, we had 15 pounds of blackberries and 2 pounds of strawberries, both at $3/pound. Not too bad for local, hand-picked, pesticide-free fruit, if you ask me. 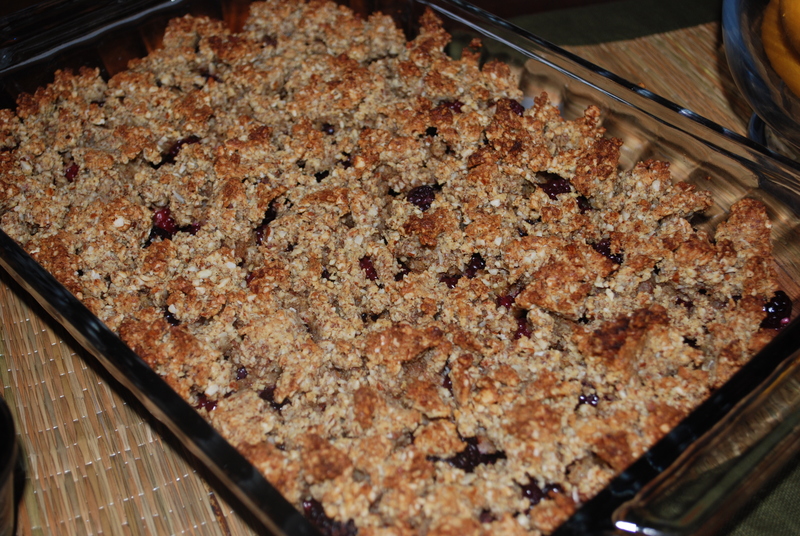 When we got home and washed all the berries, Josh decided he was going to make his famous blackberry cobbler that we had had while camping, so I said I would find a Paleo recipe to make and see whose was better. I’ll let you be the judge of that. Personally, his was too sweet for me and mine didn’t seem sweet enough (more honey maybe?). Before we headed home, I grabbed some fresh produce from their store: 2 dozen soy-free eggs at $4/dozen, a few tomatoes, the BIGGEST head of cabbage you ever did see, and some raw goat’s milk herbed cheese spread. There was no way I was going to pass up on some fresh produce that they had just picked that morning. Jackpot for this mama! *Note: I did the larger version that someone mentioned in the comments, so if you want it smaller, check out her post. 2. Pour the blackberries into a 9″x13″ glass dish. 3. In a small bowl mix together the eggs, almond meal, ground sliced almonds, and coconut oil, and shake in a bunch of cinnamon. Stir well. *The mixture will be really thick and clumpy. 4. Drizzle a bit of raw organic honey on top of the blackberries. 5. Crumble the almond meal and ground almond mixture on the top of the blackberries by hand. Bake in your pre-heated oven for 35 minutes. 6. Serve in bowls with cold “So Delicious” or canned coconut milk poured over the top. 1. For pastry, cut the cream cheese and butter into flour and salt. Form soft dough into ball and chill. 2. Pour berries into 8″ x 8″ pan and sprinkle with sugar, nutmeg, cinnamon, and juice. 3. Sprinkle with flour and drip melted butter over the top the fruit. 4. Roll well-chilled pastry dough to about 8″ square. Carefully place the crust over the berries. 6. Serve with vanilla ice cream. 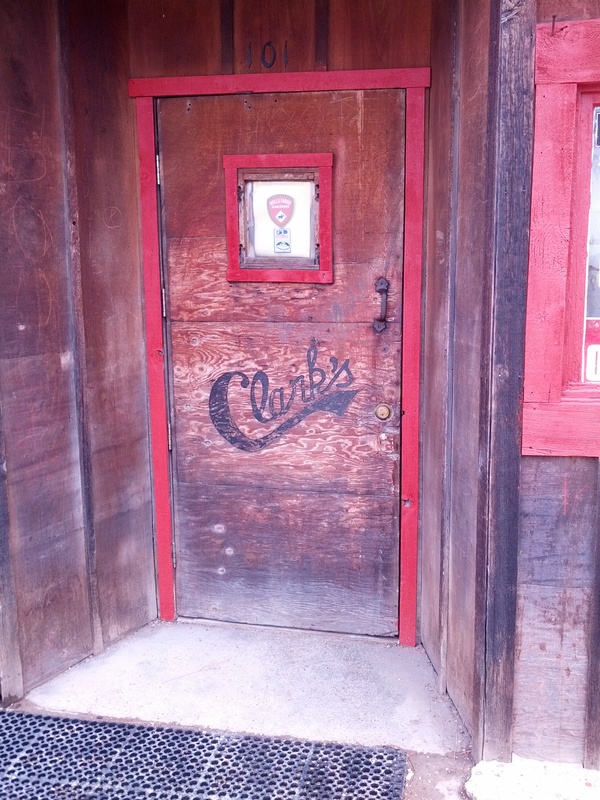 Oh, I wanted to mention that on our way home, we happened to find this little BBQ gem called Clark’s Outpost, so we filled up our bellies from all that picking and drooling. Who would have known that this place was so famous-many of their customers “include celebrities, from models to sports stars, some of the top chefs, actors and actresses, or the folks that clean out the horse stalls at the local ranches.” I don’t know about all that celebrity business…we just wanted some BBQ and we were not let down! 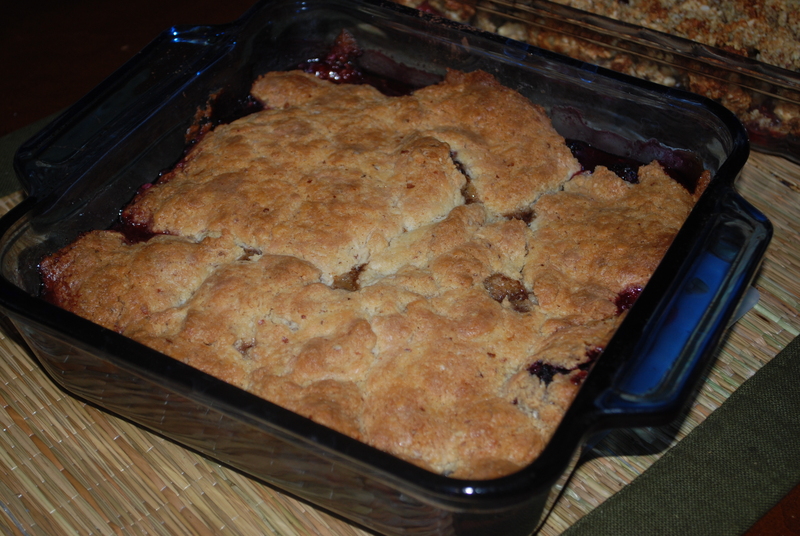 tried the Paleo Blackberry Cobbler – it was yummy but the topping was not exactly crisp, it was very hard. Is this the reason to pour coconut milk over it?